The Dismal Swamp Gift Shop carries T-shirts, denim shirts and hats with the blue heron logo. Other gift items are also available. In April 1989, the NC Dept. 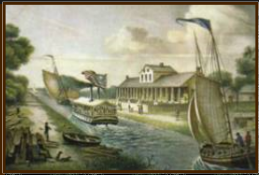 of Transportation became pioneers in the travel industry with the opening of the Dismal Swamp Canal Visitor Center. It is the first Visitor Center built off an interstate in our state and the only such facility in the country greeting visitors by both a major highway and historic waterway. The Dismal Swamp Canal, oldest man-made waterway in the country still in use today, is part of the Atlantic Intracoastal Waterway. Over 500,000 travelers visit our Center each year, and between 1,700 and 2,000 boats transit the waterway annually. 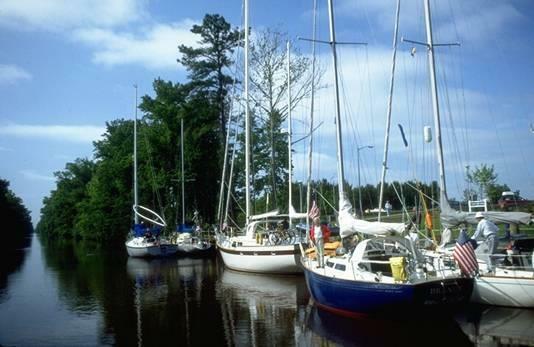 A priority with our staff is to promote usage of the Dismal Swamp Canal by boaters. Before each major boating season, posters are mailed to marinas on the East Coast encouraging boaters to "Do the Dismal." Grant monies provide advertisement in the Mid-Atlantic edition of Waterway Guide. Staffers cater to members of the boating fraternity when they dock at the 150' face dock on the Canal. Staff and volunteers bring in paperback books for a "Boater's Book Exchange." Several videos of the ICW and NC waterways are available and we have been known to serve popcorn when several boaters get together to view the film. When boats are detained at the Center due to bad weather, staff members bring food and homemade goodies to make their stay with us more pleasant. Staffers often carry boaters to the local grocery store in our personal vehicles. The Center is open from 9am - 5pm seven days a week from Memorial Day to October 31, and Tuesday thru Saturday from November 1 to Memorial Day. Email: dscwelcome@coastalguide.com. Website: www.DismalSwamp.com. Address: Dismal Swamp Canal Welcome Center, 2356 Highway 17 N, South Mills, NC 27976. 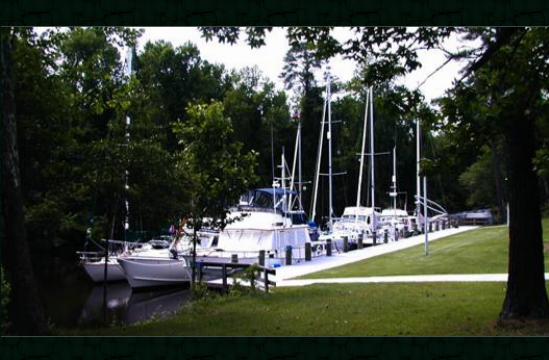 Boaters on the 22-mile long Dismal Swamp Canal are welcome to tie up to the 150-foot face dock and spend the night. The Visitor Center is located at Mile 28 on the ICW. Locks, located at each end of the Canal in Deep Creek, VA, and South Mills, NC -- open four times a day: 8:30 am, 11:00 am, 1:30 pm & 3:30 pm. Dismal Swamp Canal Welcome Center, 2356 Hwy 17 North in South Mills NC.